Chloe was diagnosed with Stage IV Burkitt’s Leukemia, a fast-growing form of non-Hodgkin’s lymphoma on Thanksgiving Day, 2016. 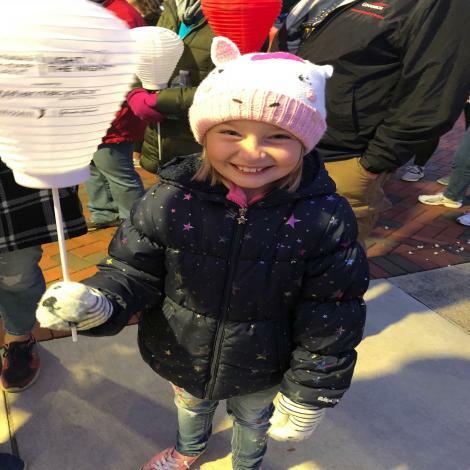 On the Sunday after Thanksgiving, Chloe began a treatment protocol that would involve six rounds of intensive chemotherapy over five months. By December, Chloe suffered a massive seizure and stopped breathing as doctors feverishly worked to stabilize her. After those two months of grueling treatment, Chloe’s CT scan and blood work showed no signs of cancer on February 21st, 2017! Chloe’s last chemotherapy was administered on April 1st, 2017 and has been in remission since. Chloe, whose favorite color is pink, loves all forms of dessert! When she’s not eating cookies or ice cream, she loves to paint, swim, and look at Christmas lights. Chloe loves spending time with her family, especially when they are eating at Olive Garden. Chloe lives at home with her parents, Chris and Christie, and her brother Caden.